Round 1 Qualifying for the $50,000 James W. Paul 3/8ths Mile Derby Wednesday Afternoon, February 6! ROUND ONE QUALIFYING FOR PALM BEACH KENNEL CLUB’S $50,000 JAMES W. PAUL DERBY WEDNESDAY AFTERNOON, FEBRUARY 6! West Palm Beach, Fl. 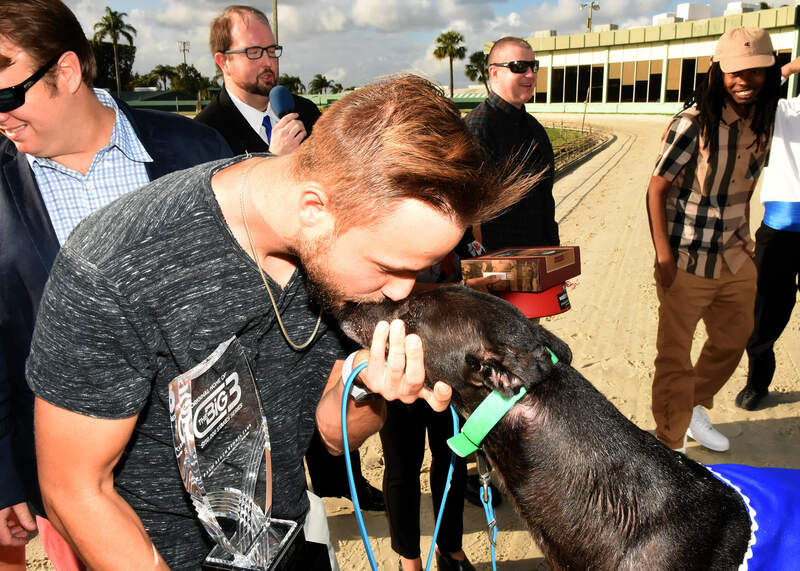 – Round one qualifying action for Palm Beach Kennel Club’s $50,000 James W. Paul 3/8ths Mile Derby gets underway Wednesday afternoon, February 6. Forty-Eight Greyhounds will go to post in six qualifying races which will be contested on the 660-yard Pat C Rendezvous Three-Eighths Mile Course. All 48 Greyhounds will return for round two on Saturday afternoon, February 9. Following the second round, the field will be trimmed to the top 32-point earners for round three on Wednesday afternoon, February 13. Another cut after the third round will bring the field down to 16 semifinalists, who will battle it out for the final eight on Sunday afternoon, February 17. The $50,000 James Paul Derby Championship Final will be contested Saturday afternoon, February 23. Unlike previous iterations of the $50,000 James W. Paul 3/8ths Mile Derby, there really isn’t what one would call an early favorite to win it all. But of course, one or two could emerge after a couple of rounds of qualifying. Race 6 appears to be a matter of class, with the nod going to veterans #3 Bartsrunninloose (Pat C Clement – Barts Magpie, James Douglas Kennel) and the big-closer #5 Tatooed Tommylee (Djays Octane – Hey Dodi Lou, Brindle Kennel). Race 8 is a tough one to handicap, but one must keep a keen eye on #6 TC’s Bitterman (Djays Octane – Hail Storm Bones, James Douglas). If Bitterman can clear the initial turn first or second, he could very well win in a romp. There are a lot of scenarios possible in Race 10. Post time favorites look to include #2 KB’s Davilla (Atascocita Gray – BOC’s Haiti Baby, Rader Racing Kennel) and #3 O Ya Fire Fly (Kiowa Mon Manny – O Ya Victory, Lester Raines Kennel). Race 12 is a qualifier where almost every Derby entry has a shot at victory. However, the post time favorite looks to be #5 B’s Scepter (BOC’s Blast Off – BOC’s Magic Wand, Brindle Kennel) due to his previous outings on the middle distance. Race 14 features, if one had to name a Derby entrant that would be considered an early favorite, is the impressive #6 Elizabeth Banks (Pat C Clement – WW Lonesome Dove, D. Q. Williams Kennel). She has taken to the Palm Beach middle-distance very well since arriving from Wheeling Downs, West Virginia. In Race 15, the most likely fan favorite appears to be #5 Daniel Craig (Flying Westover – Paul Walker, D. Q. Williams). Also, in a good spot to finish in-the-money is #1 Bartsblackrushin (Gold Town* – Barts Magpie, James Douglas). Post time for Wednesday afternoon’s first race is 1:00 p.m.